Techniques of kumite for all levels. 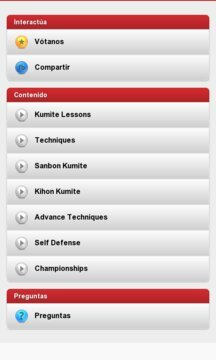 Karate kumite is ideas to learn the techniques of combat more simple and difficult. Better your skills of kumite. If you want to learn or perfect the martial art of Karate, this app is what you were looking for. Will allow you to learn the sport of Karate. Ideal for beginners and advanced levels. You can find combat techniques, kumite. You will learn everything you need thanks to our video tutorials. Suitable for all levels. The Katate is a martial art and a sport that will help you to find a perfect balance between body and mind. In addition, it is a fun way to get in shape. You will learn how to defend yourself from assaults on the street. Do not hesitate, this is the app that you were looking for, descargala ya. - Techniques for beginners and advanced. - Videos of championships of kumite. - Videos of techniques, defensive to stop all kinds of assaults. This app is part of a cycle of apps of sports, among which you will find another app of karate focused on the katas of all schools in the Shotokan, Shito-ryu, Wado-ryu, and other as a basketball coach.